Reviews | Regal Chipotle Powder - 16 oz. Add some spice to your signature menu items with Regal chipotle powder! Derived from smoke dried jalapeno peppers, chipotle powder will add a dash of zesty flavor to any dish you choose. This flavorful spice is commonly used in Mexican and South American cuisine. Whether you use it to spice up your barbecue, or bring some heat to your stews, this flavorful spice is a must-have addition to any kitchen. I was really having a hard time finding chipotle powder in local stores that tasted fresh and didn't cost a fortune. thank goodness for Regal and Webstaurant love them both! Great powder, for years we were buying Tabasco Chipotle in our recipe for BBQ sauce, it got too expensive, switched to dry leaves, tried this once a year ago and now it works great, 70% less than Tabasco. I only with this came in a larger bottle such as a 4LB or 5LB bottle which would really help our restaurant. Main ingredient to a ton of our dishes which I feel like I am losing money on having to always buy so many. Nonetheless still a great product and will definitely buy again. Regal's Chipotle Powder is my go to for my BBQ rubs and sauces when I want to add a little heat that shows up on the back end. we wanted to try this to make a new chicken based recipe on the bbq grill. it came out excellent. it does have a spicy flavor thou. Freshly ground chipotle powder is some of the most impactful flavor you can get from a Regal Brand spices. It has a unique smoky flavor along with just the right amount of heat. This makes ground chipotle powder my go to for spicing up my BBQ sauces. It’s really easy to simply add in just little for flavor or add in a lot for both flavor and heat. I cant say enough about the freshness of regal products, especially with heat type spices as chipotle, it diminishes as it sits on the shelf. Not this one, go and buy it. The Chipotle powder is amazing and full flavored. A great powder to add to our dry rub seasoning for an extra kick of spicy flavor. The regal chipotle powder is great. The powder is well ground and is great for making our own taco seasoning. The flavor is bold and smells great cooking. I love the smoky heat that chipotle powder adds to dishes. The powder is great for our chicken that goes into our fajitas. The flavoring is great. The Regal Chipotle powder is great . The depth flavor this adds to food is amazing. We use this in rubs and marinades as well . Great price! We will be purchasing more of this in the near future. The Regal Chipotle powder is bold and spicy. The perfect spice for making our chipotle grilled chicken fajitas. A nice packaging and easy to pour container. The quality of this chipotle powder surpasses most that we have used with our recipes. Highly recommend as there is great flavor and the amount for the price is even better. We use this chipotle powder in bbq rubs. Excellent product for the low price. Silky powder that's flavorful and inviting. The color is bright and not dulled. Great buy! Chipotle powder is a favorite spice of mine to have on hand. The Regal brand is one of the best that I have tried. This product truly makes my dishes pop! I feel this is more the "Morita"-style chipotle. In my mixes, it works perfectly as it's relatively mild, but as a stand alone, it's not my favorite. Only because I prefer my chipotle powder a bit hotter. Still, for the price, you're getting a solid chipotle powder. Just remember, hot pepper spices do not tend to last a long time, so if you're planning not to use the powder in a short amount of time, you may want to purchase a smaller container or at least transfer the powder to a glass container and keep it, like your other spices, away from heat and light. I love to add a small amount of chipotle powder to my homemade salsa in addition to fresh jalapenos. This is a great price for the quantity. The Regal Chipotle powder is awesome. The flavor is bold and prominent and is a really good spice to use on grilled chicken and pork. 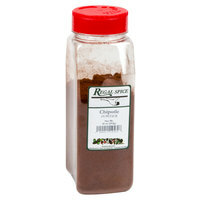 The Regal Chipotle Powder is the perfect spicy and smoky seasoning to any dish. This seasoning is a bit spicy so just be careful how much you put on food or it'll take over the flavor. This powder is not the usual slightly sweet I purchase from other stores so if you want it a little sweet just add brown sugar. The natural smoky flavor of chipotle peppers are awesome. Great to use in chili, hot sauce, or marinades. It's even good in meatballs for a smoky kick. This Regal Chipotle Powder gives that little extra kick to your recipes. It has the best flavor and is so fresh. I always keep it in my pantry! The chipotle powder is very smoky and full of flavor. The powder is nicely ground and very good quality. It is perfect for seasoning our chicken for our chipotle chicken and black bean burritos. We use this chipotle powder in many of our dishes as well as in our soup! Adds a great extra boost of flavor! Great bang for your buck and the container is perfect for keeping your kitchen organized and spicing up any dishes you may choose! Great product. we use a lot of chipotle power in our recipes and were beyond excited when we found this in the 16 oz containers. Not only does it save us a ton of money buying it in bulk, but it is also a great product. The chipotle powder is a new spice that I am trying in my different recipe that adds a nice addition to my common spice rack. It can season meat for salads and other dishes that all for it. So we were nervous to try this and we don't like the smoked paprika we've had before, but this is actually good! It's more of a BBQ flavor than a smokey unnatural taste and there is a bite to it afterwards of yummy hot peppers. Great on roasted broccoli or in sauces! I have looked in all my local grocery stores for chipotle powder and have never been able to find it - so happy Regal sells this spice! I wish I could have purchased it in a smaller size, but the flavor is good and we cook a lot of Mexican food in our house so I know it will get used. Highly recommend the Regal Chipotle Powder it has quite the powerful flavor. Need to add a little heat to any dish this is the product for you! Chipotle has become very popular in recent years. This does add a bit more spice to liven up many dishes, especially sauces, sauces, and rubs. I highly recommend that you buy the Chipotle powder from WEBstaurantStore in the 16 oz size the price is fans flavor is very good we love it in so many Tex Mex dishes or soups . The Regal Chipolte Powder is a good value. This is my first time using it but I will definitely be ordering more when I'm out. Regal spices are excellent. Packaging keeps flavor sealed nicely. The mix and match deal is a great way to stock the spice rack. I use this in salsa and bbq sauces. Great smoky flavor. This chipolte powder is amazing! We use this in our rubs and sauces and to cook with. It has a fine texture and is very flavorful! The great thing about this powder is that it is much more affordable here than anywhere else we have looked. Love this stuff. Tastes exactly like what it is, real ground chipotle chiles. Very fresh, doesnt clump either. Ill buy this powder again for sure. Regal Chipotle Powder is fantastic! Soooo much less expensive than buying the small containers at the grocery store and very high quality. Great flavor, will reorder again and again! A nice and spicy product with just a bit of smoke. I use it in my bbq rib rubs and its worked well. A little goes a long way. This is a great alternative to cayenne powder. Same heat but more flavor from the smokiness of the jalapenos. I had a very hard time finding chipotle powder without it being a blend of spices. Great price and on time shipping! Excellent quality for a very low price compared to top brands. This item tem is a complment to my spice cabinet. And I will continue to buy these spices and herbs. At first, I wasn't too happy with the taste, since it's not as strong as what I expected from previous experience. However, I've since gotten used to it, and at this point I've actually grown to love it. So to me, it's a great product, but it just doesn't have quite the kick you'd expect. We very much like this Regal Chipotle powder for both flavor and convenience. We find it very economical from the Webstaurantstore and would recommend this product. This seasoning has a great flavor too it and it gives just the right amount of kick that is needed. It is not too spicy, so those who do not like really hot stuff will still find this seasoning tasteful. Hard to find in local stores, this Chipotle powder is as good as it gets. Great in many different recipes and sauces depending upon your menu. Great price for chipotle powder as it tends to be expensive and a lot of times over priced. Works well in Mexican dishes such as tacos, fajitas and enchiladas to get that chipotle kick. Just add to premixed Mexican seasonings or just make your own with all the wonderful spices available from The WEBstaurant Store. This is a unique spice that is perfect for marinades, sauces and even dry rubs on steak or pork. I like using it in BBQ sauce and flour mixes.